← There Is No Shortage of ‘NEW’ to Try! Growing up, I remember my mom always sending me out to the composting bin with a bucket full of (what I thought was) gross bits and pieces of food waste. I never understood why anybody would want to keep all of that stuff, or why my mom sent me to the very back corner of our large yard with it so frequently. This was not a pleasant task for my 8-15 year old self. I remember opening the lid of our composting bin and what felt like a billion wasps, bees, and fruit flies coming out of the bin. I’d always hold my breath, dump the bucket, and run away as fast as I could. It smelled, it attracted bugs and it seemed like a pointless effort to me. Now, as an adult with her own home and garden, composting is (pathetically?) exciting! I love dumping buckets full of organic waste into our homemade bin. I love seeing the worms and bees in the compost. There’s nothing happier to a wannabe gardener! This is one thing that I didn’t understand as a kid, but I sure do now. Why compost organic waste instead of throwing it in the garbage and letting the city take it to the dump? 1. Composting can save you money. There are different uses for composted material, which I’ve outlined below, and store-bought alternatives can be quite expensive. 2. Composting attracts good bugs. Yes, there is such thing as good bugs! Composting attracts bees, worms, and other bugs which help your garden thrive. 3. Composting is a great way to help your plants grow. If you have a garden or even a lawn, composted material is incredibly good for it. Better than anything store bought, and, if you watch what you throw in that bin, is an organic alternative to any fertilizer or plant food you can buy at the store. Composted material can be used as a fertilizer, a soil, and a plant food. It can also be used to, as mentioned above, attract creepy crawlies that make your garden thrive. A banana peel is full of nutrients that you didn’t consume in your diet. Composting that banana peel adds the nutrients to the soil, which helps plants grow stronger, faster, and bigger. You can distribute compost on your lawn as a fertilizer or with seed. You can use it in potted plants or garden beds. You can use compost as a top soil. Compost can even be used to control erosion. A general rule of thumb for composting, is that if it came from the earth, it can go back into the earth. You can therefore compost produce scraps (peels, cores, seeds), lawn and yard waste or trimmings (grass clippings, leaves, branches), coffee grounds, nut shells, even paper products. Be careful when composting paper products; there are many products with a waxy coating which should not be composted, and fliers that have chemicals in the photography or ink. Composting these types of products will cause a leach of these chemicals into your soil, which is harmful. Also compost egg shells, and wood chips. Many sources say that ashes from a fireplace can be composted, but this is something that I avoid. Wood smoke can be carcinogenic and I don’t want to take the chance. This is the easiest part about composting – actually doing it! I keep a container under my sink in the kitchen, and every time I have matter that I’d like to compost (ie an apple core), I put it in the container. I seal the container and every couple of days, I take the material out to the compost bin we have in the yard and dump it in there. We made a compost bin out of wood (like this one). You can buy plastic bins at Home Depot, but as a general rule I don’t trust anything that is plastic. I don’t want the chemicals to leach into my soil. Every once in awhile (usually once in the spring and once in the fall before the ground freezes), churn the composted matter. Because compost bins can attract bugs with stingers (bees, hornets and wasps), you may want to put the compost bin on the outskirts of your property. When you’ve accumulated enough compost, use it as you wish. Yes, we also compost, where in fact, we do have a compost site at our backyard. Since we moved here my father made a compost site and we put the fertilize soil for our plants and garden. 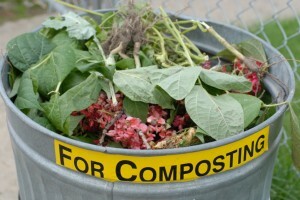 Composting is so good for your garden, I’m glad you participate! This is very timely since I plan to start composting this year! We eat a lot of fruits and vegetables and I would love to put the waste to use! Exactly – why throw it out when it can be helpful? We’re lucky in that our city started about a year ago curbside compost pick-up. It’s great! But this year I may put in a garden, so I need guidance like this, thanks! Many cities around here to curbside pickup but it’s throwing away a really great resource! Yes ‘beasties’ as I call them (insects) are unwanted to a point. No one really wants hornets and alike zooming around their property at summer time but the environment is so much more important than our irrational fear of bugs (so long as they’re not Bot Flies – evil). The way I see it is we should make the Earth better for our animals and our own personal space. Great article. I definitely agree with making the Earth better. I like to do all I can.